I’m not a huge fan of peppermint, at least not by itself, but I love a rich peppermint-chocolate dessert. With that in mind, I took my homemade brownie recipe (from Easy Homemade) and doctored it up a bit. The result was these peppermint brownies, and they definitely fit the bill! In a medium bowl, mix sugar, flour and cocoa. Add butter, eggs and both extracts and beat for 3 minutes. Pour into a greased 9×13 pan and bake at 350° for 30 minutes or until a toothpick inserted in the center comes out clean. 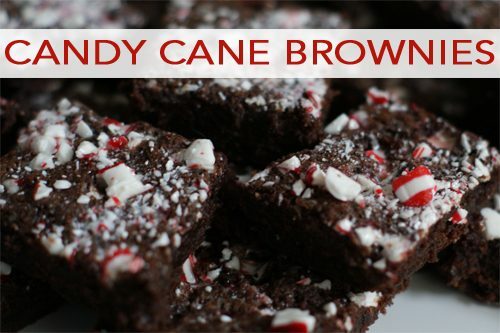 Immediately sprinkle crushed candy canes on top and gently press into the brownies. Let cool for 20-30 minutes before cutting.